The year 52 A.D is dear to the Christian community in kerala as it marks the date when the Apostle Thomas introduced the Gospel to the people in India. He established seven Churches and a chapel before leaving for other places. The buildings did not survive the onslaught of time, and the most famous one in Nilackal in the hills vanished when the flourishing town was overrun by brigands. However, the people held on to the new faith and many escaped to distant places north and south where they worshipped in temporary sheds for centuries. The churches were few and far between so people walked miles to attend services. The people of Mylapra attended Mass, earlier in Thumpamon, or Omalloor and later in Makamkunnu. But even that was too far away for most people so the folk here decided to bulid their own Church. In about hundred fifty years, the St.George's Orthodox Church has been housed on six sites. The building consecrated in 2004 was the seventh one to be constructed. To begin with they were all temporary sheds hastily put up to accommodate the parishioners, and the first one to be so built was at konnakote where the Brethren Hall now stands. A difference of opinion caused one group to decide on a new shed for their own use. Priests from the Thengumthara Family would come over to conduct services. However, a mysterious fire burned down the shed and made the parishioners look for a new site. It was then that Potha Varkey donated the land on which the church now stands to all the 64 members of the church and the new members that had joined. 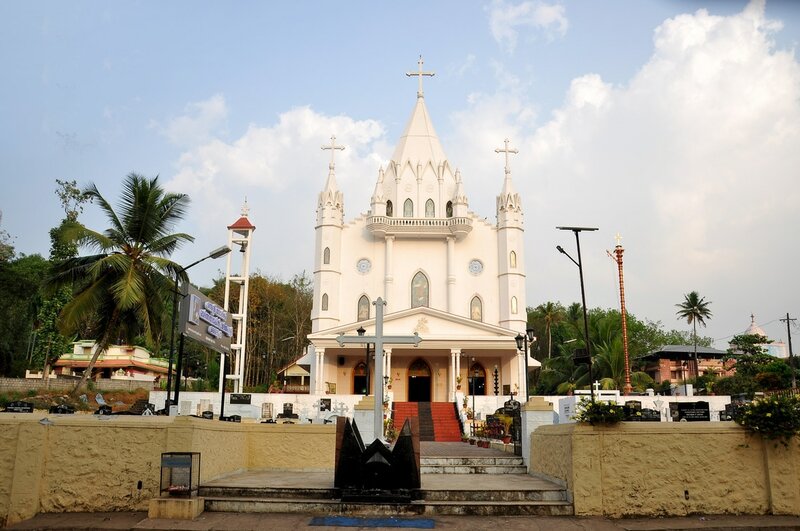 Earlier an oil mill functioned on this land , and so this church has always been known as “chakittayilpally”. When over time this fourth church fell into disrepair, laterite bricks and lime were used for a more lasting building on the right side of the road. 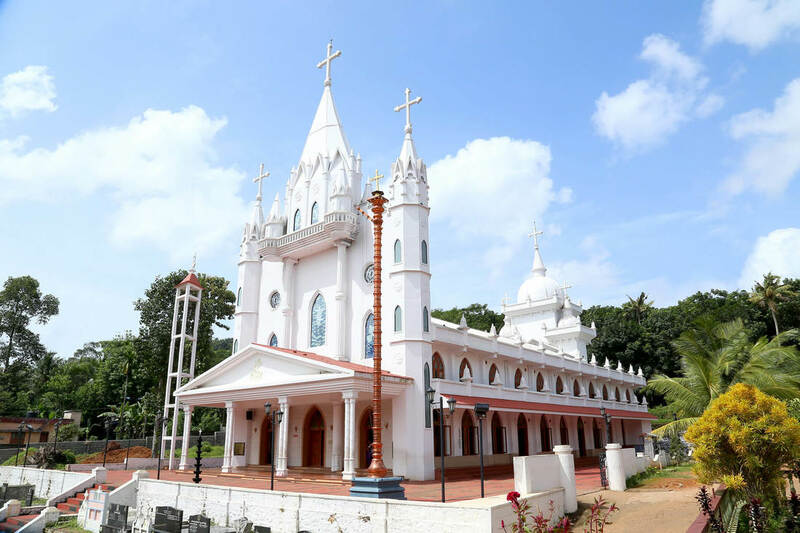 As early as 1891 Geevarghese Mar Grigorious of Parumala had laid the foundation stone for a permanent building a little to the northeast on of this laterite building and soon the parishioners were able to hold their services there in this sixth church. The first half of the twentieth century saw two world wars, which naturally affected the economy of the world. India got its freedom from the British after World War II. Money was scarce, and though a large church was required it was only in 1953 that a new church building could be consecrated on the present site. One must mention here the untiring efforts of the vicar, Thengumtharayil Geevarghese Cor Episcopa II who was responsible for this, and when he was too old to officiate, the Parish paid him an honorarium to the end of his days . The Church had no porch, so in May 1966 Paulose Mar Philoxenos of the Kandanad diocese laid the foundation stone for building a porch, which was completed by 1969. 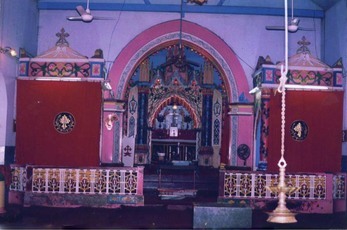 In 1979, a belfry was added to the building and Shri. C.G.Pathrose of Parthalapadiyil donated money for a new bell. However the Church was too small to accommodate all the parishioners.The population of Mylapra was growing, so it was decided that the present building would be demolished and a new building would be constructed on the site. 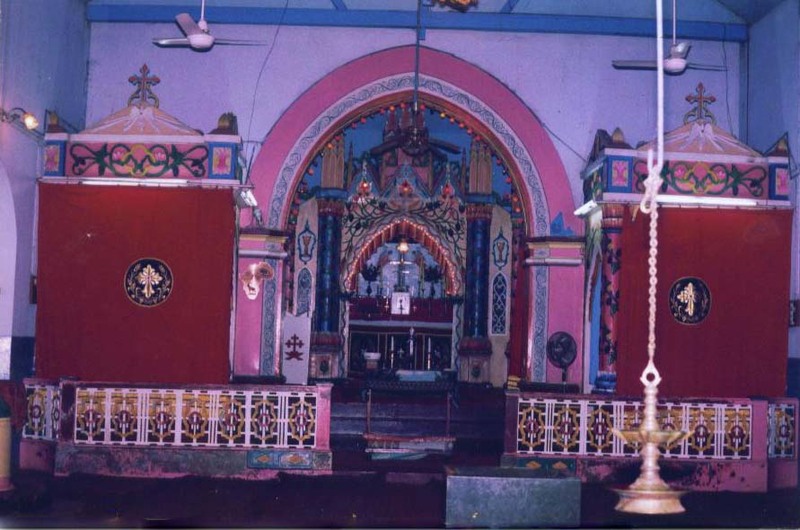 Accordingly, a hall dedicated to the memory of Thengumtharayil Geevarughese Cor Episcopa II at the far end of the premises was converted into a temporary church and the construction of the new building was begun. Mrs. Rhona Varghese of Ernakulam was invited to do the interior decoration. She did a magnificent job and today people visit the Church not only to pray but also to see the interiorof the beautiful church. The then Catholicos of the Orthodox Church, His-Holiness Baselios Marthoma-Mathews II, was so impressed that he asked that the Church be kept open through the day for the faithful to come and in and pray. At all times of the day there are people dropping in for a word of prayer. The church had a two storied building housing an auditorium on the first floor. The ground floor houses the civil supply depot of the district. A row of shops built on the land below the auditorium bordering on the Punalur-Moovattupuzha Road.The rest of the land is used as a parking lot. 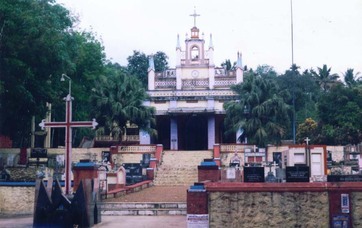 The Church has chapels in Mundukottackal, Idakkara, Mannapuzha, and Valiyenthi. The churchyard is not large enoughto accommodate a bigger cemetery, so a vault was built for the purpose. A very popular part of the church is its wayside Cross at the foot of the hill. There is a belief that a traveller will have no mishaps but will return home safe and sound if he stops to pray by the cross when passing by. In the mornings, there is often a queue of vehicles waiting to make an offering there. Buses, lorries, cars, and two and three wheelers stop for a word of prayer and make an offering. Pilgrims of Sabarimala invariably stop to make an offering. It is indeed a heart-warming sight.